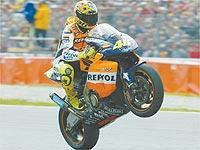 Valentino Rossi rode a textbook race to win at Donington, despite a great start by Carlos Checa. Checa led for much of the race but could not break away from the reigning champion. As first Roberts, and then Biaggi faded, Rossi focussed his attentions on Checa, until the Spaniard folded his front wheel going into Goddards. From then on, the final laps were a chance for Rossi to celebrate the victory whilst maintaining a four second gap to keep Biaggi in second, with a third for the two-stroke of Alex Barros taking third. Britain’s hopes faded with the retirement of Jeremy McWilliams, who was in the top ten after a disappointing start, until his race finished in the pits. Rossi has now beaten Barry Sheene’s percentage of wins, and now has 46 wins across the three classes. Marco Melandri survived a dramatic last lap to win the 250cc race. After the exit of early race leader Sebastien Porto when his engine appeared to seize, it became a tactical battle between the championship leaders, Melandri and Fonsi Nieto, with Franco Battaini holding a watching brief in third. In the last lap, however, it was all change. It began with Toni Elias, who had squandered his grid position by dropping to twelfth at the start, mugging Battaini for third place. Nieto had only been able to provide a couple of wild lunges at Melandri, but he finally passed the Italian coming into the Esses. Melandri put himself up the inside at the Melbourne Loop, almost touching with Nieto, before taking the win. The two Brits, Jay Vincent and Leon Haslam, finished outside of the points in 16th and 17th. The 125cc race was won by Frenchman Arnaud Vincent. He took the win from Daniel Pedrosa and Manuel Poggiali. The race was between the three of them, plus Lucio Cechinello. It was Daniel Pedrosa who led the early stages of the race, until Cechinello came past him on lap six. Vincent took the lead on lap 23, and despite some place swapping, was able to stay in the lead to cross the line. Vincent attributed his victory to a last minute tyre change on the grid which gave him tyres which worked well right until the end of the race. Britian’s Chaz Davies was looking good for his best result in a points-scoring fifteenth place, until he missed a gear coming into the Esses on the penultimate lap. His mistake meant he finished the race in sixteenth place.